"Vibra" Drawer Magnets are designed to remove fine to coarse contaminant's from dry granular free-flowing materials, such as sugar, grain, tea, plastics granulate and powdered chemicals. 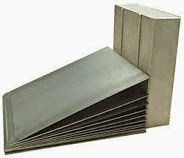 For a higher level of protection, double or triple layer grate magnets can be used. 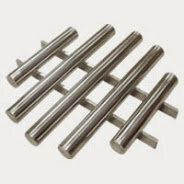 All grate magnets are available with either Ceramic or powerful Rare Earth magnets material. 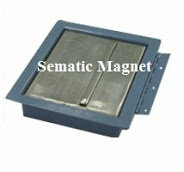 If contamination of fine iron particles is your problem, Sematic Magnet has a new design of magnet. This unique design is engineered to even the finest iron particles. Pipe Magnet is an efficient extracting iron particles from free-flowing granular products. It suitable for installation in pipe line or ducted systems, as material flows over the conical shape magnet, any iron particles is attracted to the highly magnetic surface and securely held in position. 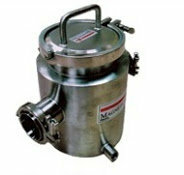 Internal deflectors ensure that the product is a pass over the conical magnet with minimal turbulence and no blockage. The pipe magnet is easy to clean the iron particles by releasing the quick release latches on the door, allowing the magnet to swing open for cleaning. 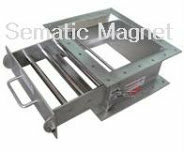 Cross Belt Suspended Magnet are deigned to remove unwanted iron particles from heavy burden depths of material being conveyed on fast moving conveyor belts. There are ideal for separating iron particles from wet or dry, fine or course conveyed materials in large or small volumes. VIBRA Permanent Magnetic Sheet Separators are designed for faster, safer handling of stacks of sheet stock – any size, any thickness. Hopper Magnets available in a variety of shapes and sizes for use in round, square or rectangular hoppers, chutes, housings and bins. They are an effective way to remove ferrous metal and tramp iron from free-flowing materials such as plastics, foods, cosmetics, grains and minerals. Hopper Magnets with stainless steel construction with optional rod and angle baffles positioned between magnetic rod to direct the product flow over the magnet (plain style, with no baffles, is also available). Magnetic rod is available as Alnico, Ceramic or Rare Earth magnet material. 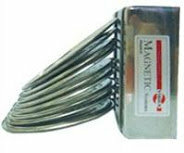 Magnetic Pulley are some of the simplest, yet most effective magnetic separators. Just mount it in place of a standard head pulley and is easily and efficiently separate iron particles from the product stream. Vibra Liquid Magnetic Filter is designed to extract iron particles from slurry or liquid raw materials in order to purify the material in the production process. Strong magnetic rods filter the flow and extract the unwanted iron contaminate. This unit can simply be connected to the existing pipeline via flanged or threaded ends. Simple and easy access is possible using the quick release lid. Cleaning of the magnets is easily accomplished by removing the cover plate of the housing and sliding the magnet. All the magnetic rods are waterproof. Well polished. Custom size can be supply on request. Vibra Permanent Magnetic Hump, is an in-line magnet for extracting fine iron metals from pneumatic conveyor systems. The leak-proof stainless steel hump contains two powerful magnetic plates positioned at right angles to each other. Materials passing through the chute system are evenly distributed through the hump and across the magnets with little turbulence and no blockage. Any unwanted iron metals within these materials will be automatically extracted. Manufactured in any size or materials to suit customer's requirements. Available with powerful rare earth magnets to extract weakly iron particles. Aerodynamically shaped with a solid stainless steel nose cone, the flow-thru design of the Bullet Magnet allows the magnet to be used anywhere in a pneumatic line system. It can be used ahead of processing equipment and bulk load out to assure product purity and protect machinery from tramp iron damage. "Vibra" Permanent Suspended Plate Magnet is recommended for the product with low contamination, are powerful and non-electric units. It is designed for high separation of ferrous metal from free-flowing granular or clumping material in over-the-belt conveyor, chutes and vibratory screens. Indeed, if the frequency of the impurities is too high, these will make a layer shunting the magnetic field. In this case, the device will require frequent cleaning. These manually cleaned units provide maximum protection from equipment damage and related hazards caused by tramp iron. 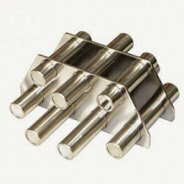 Each of these magnets is supplied with eyebolts to aid in handling or overhead suspension. Grate Magnets available in a variety of shapes and sizes for use in round, square or rectangular hoppers, chutes, housings and bins. They are an effective way to remove ferrous metal and tramp iron from free-flowing materials such as plastics, foods, cosmetics, grains and minerals. Grate Magnets with stainless steel construction with optional rod and angle baffles positioned between magnetic rod to direct the product flow over the magnet (plain style, with no baffles, is also available). Magnetic rod are available as Alnico, Ceramic or Rare Earth magnet material. VIBRA Permanent Bullet Magnet protect processing equipment and product purity by capturing iron contaminates in vertical flow systems. It provide product protection for many industries including flour, feed and grain, food processing, powder and bulk, chemical resin and plastic processing, etc. “Vibra” Rotary Grate Magnets with housing are designed to remove both large and small pieces of unwanted iron particles from material flows which are stickly and irregular in shape, such as milk powder, meat powder, sugar, pet foods and etc. This to prevent damage of expensive machine and at the same time providing higher product purity. Vibra Magnetic Plate, VBPL series are used to capture or remove iron particles from dry or wet material flows on transport belts during free fall, in ducts, chutes and other types of enclosed flow lines. Magnetic Drum are used for the separation of finest iron from powders and granulates materials that carry a high percentage of iron contaminants. Material to be processed enters the top of the drum magnet, flows across the face of the rotating drum and exits through the bottom clean material section. 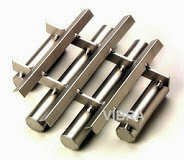 Vibra Permanent Plate Magnets provide dependable and economical protection against tramp iron damage in a wide range of applications.It can remove very fine iron particles from dry or wet products. Vibra Permanent Grate Magnet is designed for fitting in hoppers, Vertical Ducts, product intake points and at finished goods outlet points, to remove medium and fine iron contaminants from dry free-flowing products such as sugar, grain, tea, plastic granulate and powdered chemicals. Grate Magnets available in a variety of shapes and sizes for use in round, square or rectangular hoppers, chutes, housings and bins. They are an effective way to remove ferrous metal and tramp iron from free-flowing materials such as plastics, foods, cosmetics, grains and minerals. Grate Magnets with stainless steel construction with optional rod and angle baffles positioned between magnetic rod to direct the product flow over the magnet (plain style, with no baffles, is also available). Magnetic rod is available as Alnico, Ceramic or Rare Earth magnet material. 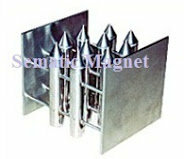 Sematic Magnet have variety design and sizes of magnetic separators. Available in standard, stainless steel (304 / 316) and food grade. We offer custom design Permanent Magnetic Separators with more powerful & more effective of capture weakly iron particles. Repair facility available at Sematic Magnet. We repair all makes and type of permanents magnetic separators. 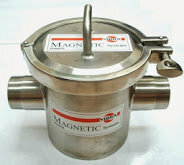 Contact us with complete application details for assistance selecting proper magnet.